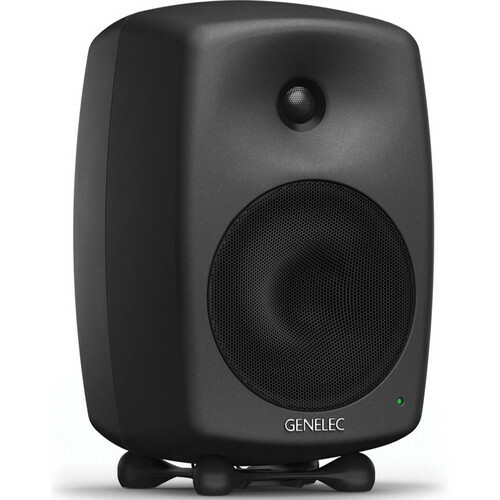 The 8040B Active Two-Way 6.5" Studio Monitor from Genelec provides an accurate reproduction of the source material in a compact form-factor with high output. Its die-cast aluminum enclosure features a rounded shape, which minimizes distortions caused by edge diffraction. The metal dome tweeter is surrounded by a smoothly-shaped Directivity Controlled Waveguide, which helps to create an even response when listening both on and off axis. The 8040B is built with Intelligent Signal Sensing (ISS) technology which automatically activates the speaker when an audio signal is detected, and puts it in Standby Mode when no signal is present, reducing the energy consumption to less than 0.5 watts. The 8040B features a 90 watt high frequency amplifier for its 3/4" tweeter, and a 90 watt low frequency amplifier for its 6.5" woofer. The bass response is expanded by a rear-facing reflex port, and a separately available Genelec subwoofer can be used to monitor a wider array of frequencies. Box Dimensions (LxWxH) 17.2 x 11.9 x 11.8"
8040B Active Two-Way 6.5" Studio Monitor (Single) is rated 5.0 out of 5 by 3. Rated 5 out of 5 by Lou from Awesome range and accuracy; built like a tank Perhaps shameful, but I don't use these to monitor. I just wanted something for a second (desktop) system that would be good enough for me to give up head phones for general listening, and keep me from a frustrating return. I considered these for several months before making the deal at B&H. Maybe overkill, but I'm a former musician, and I know correct timbre, distortion effects, etc., and that's what I expect from playback. I've had these for six months. I run them with the desktop bass roll-off, and I have no complaints; only praise. The detail, accuracy and lack of fatigue means they get a lot of use. I just upgraded my DAC, and I can say that these monitors, like any real transducer, are very responsive to better source electronics. The driver grilles are a necessity, IMO, and contributed to my decision to go with Genelec over Focal, or the Gene 040's, as did the auto-off feature. This is just a great product, and, like most great products, comes at a commensorate price. Still considering a sub option, as a sub always enlarges the apparent sound field of a near field, or any smaller-driver speaker system, in a (usually) spectacular fashion. I can't imagine anyone not being satisfied with the designed capabilities of this monitor. Rated 5 out of 5 by Flavio Medeiros from Much more that I espected! Great like always. Who knows GENELEC understand wy. The price is for two monitors? Genelec 8040B active monitors are sold as single units. Please check with your B&amp;H sales associate for pricing. Thank you. Which do you recommend 8240APM or 8040BPM? ( I'm not mixing engineer. It's for my own project from composing to mastering by myself. ?